It’s art fair season, and VoCA was in London but opted out of the crowded, frenzied booths of Frieze and Zoo, choosing instead to focus on silent, monumental, brave and important art in the galleries. We also went to Copenhagen – but more on that soon. In London, our favorite thing was the Anish Kapoor show at the Royal Academy, or more specifically, one piece in the show. Kapoor, winner of the 1991 Turner Prize and creator of Chicago’s $23 million Cloud Gate, has become one of the most important sculptors working today. 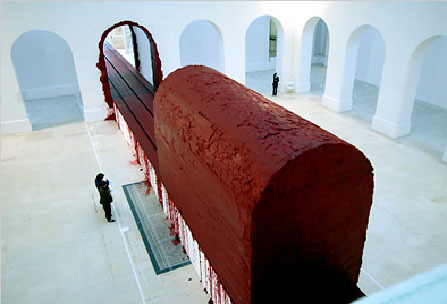 The enormous wax piece, Svayambh moved slowly on a track through several galleries. It was truly awe-inspiring. The best art always takes risks. The enormous blocks of doorway-sized buttery blood red wax appear to be entirely about the architecture, and by extension the history and meaning of the Royal Academy and Kapoors place in it. The second best thing we saw in London was the Gustav Metzger show at the Serpentine Gallery. The London-based artist is known for his auto-destructive works of the 1960s that use time itself as a medium, as in the renowned 1961 South Bank Demonstration, where the artist slowly disintegrated three large nylon ‘canvases’ with sprayed acid. 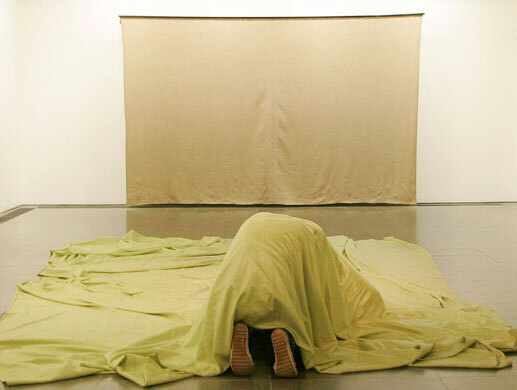 We were unfamiliar with Metzger’s work, so the sight of a visitor crawling around on hands and knees under a sheet in order to experience as much as possible of a large photograph of Jewish people being forced to scrub the streets of Vienna in 1938 was a moving and unusual way of collapsing history into the present moment. Gustav Metzger, To Crawl Into – Anschluss, Vienna, March 1938 (1996). There was also a sculpture in which a bag of water sustained a constant droplet of water on the surface of a very hot plate. Amazing, simple and profoundly metaphorical. 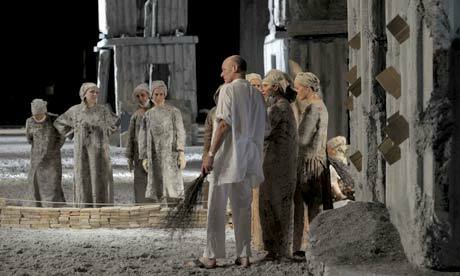 On the set of In the Beginning at the Paris Opera Bastille, directed and devised by Anselm Kiefer, in collaboration with the composer and clarinetist Jörg Widmann. The last thing of note that we saw were Anselm Kiefers latest works at the Hoxton Square White Cube gallery. Kiefer, long one of VoCA’s favorite artists, continues his monumental landscapes, these ones covered in baked clay with shards of earthenware pots attached to the canvas with wire, and spilling out across the gallery floor. According to the gallery, the new work continues to confront the violence and paradoxes of human history, its endless cycle of creation and destruction. Stunning. Click HERE for more images from the White Cube website. ← VoCA Goes to London!